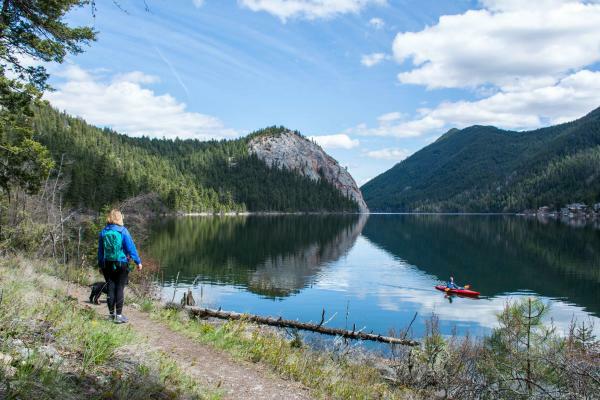 Ask locals about their favorite hike in Kamloops and the enthusiastic responses start pouring in. The number of hikes and variety of terrain is so vast that the same hike is rarely mentioned twice. Here are a few hikes that surface to the top and the reasons why these trails are so popular. 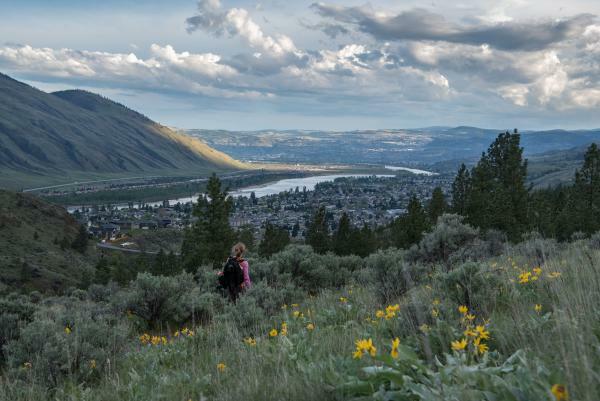 If you only have four or five days in Kamloops this spring and want to maximize your trail experience, start here. Each of these hikes can be completed in less than two hours. 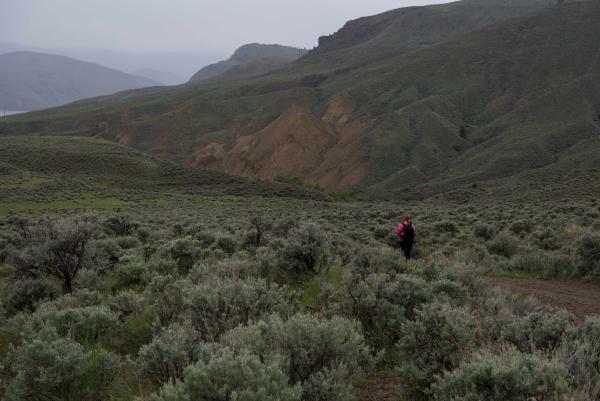 Home to large herds of bighorn sheep and mule deer this hike is fantastic for wildlife viewing. Well-defined trails meander through hills of fragrant sage and cacti that remind you that you are hiking in a desert climate. The hike gives a bird’s eye view of Padova City, a historical Kamloops icon built in 1907 to treat tuberculosis. This is a 3.5 km loop. To get there, follow Tranquille Road to Red Lake Road. Cross the rail tracks and park on the right. Enter the trailhead here and follow the trail East then North up the mountain side. Not for the faint of heart, this hike has only one hill but it runs almost the entire length of the trail. The good news is much of the hike is shaded and it’s all downhill coming back! The first lookout is at the 2 km mark. The views of Kamloops Lake are sure to reward. You can follow the rim another 4.5 km to where the trail officially ends. Along this rim you will see the many volcanic features of the Red Plateau escarpment. To get there, follow Tranquille to Red Lake Road. When Red Lake Road makes a u-turn, go straight onto Frederick Road for about 650 metres and park in the second pullout to the right. Follow the trail west over the stairs and through the fence style. A family favourite, this hike follows the shoreline of Paul Lake then begins a gentle climb through a mature pine forest to an outstanding viewpoint above the lake. Total distance is under 5 km. To get there, take Paul Lake Road. Stay right at the junction for Pinantan Pritchard Road and Paul Lake Road. At the west end of Paul Lake across from the bank of mailboxes, you will see a parking area and a sign for the “Paul Lake Group Campground”. Park here, cross the road and look for trail signage at the foot of the lake. A must do hike in early spring when the balsam root blankets the hillside. A steady but reasonable uphill climb takes you to Deep Lake. A single track skirts the lake. The return views down the North Thompson River are spectacular, especially at sunset. This trail is popular with dog walkers, families and photographers alike. Stop at the lake and fish for trout! To get there, take Westsyde Road to Ida Lane. As you approach the top of Ida Lane look for a small city parking pullout on the left. The parking is signed. Park here and walk to the top of the road. Go through the iron gate and look straight ahead for the trail signage. Keep an eye open for the single track to your left about 100 meters in. This is a loop trail. We would be remiss to not mention Kenna Cartwright, British Columbia’s Largest Municipal Park. There are a few favorites within the park. 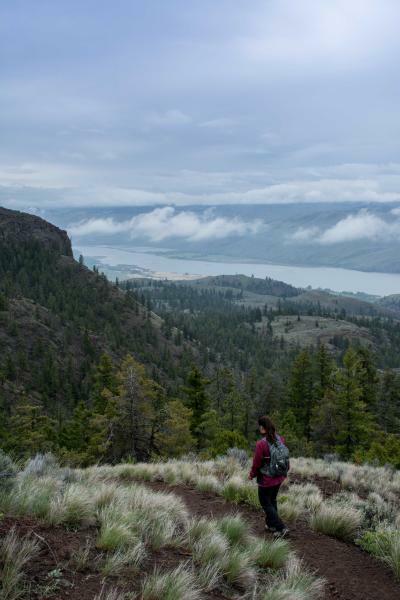 Pack a picnic for dinner and choose a path to the Sunset Trail to watch the sun go down over Kamloops Lake (Park at the Hillside lot). Or… for a longer, more challenging hike leave your car at the parking lot just off of Pacific Way and take “Doc Findlay” to any of the blue or black diamond trails identified on the map http://www.kamloops.ca/maps/pdfs/KennaCartwrightPark.pdf. Ruffed Grouse and the new Owls Perch are good choices. Create your own loop back.